NYPD Intelligence Unit Seen Pushing Rights Limits Since Sept. 11, 2001, the New York Police Department has become one of America's most aggressive gatherers of domestic intelligence. Directed by a retired CIA veteran, the NYPD intelligence unit dispatches undercover officers to keep tabs on ethnic neighborhoods, sometimes far outside its jurisdiction. 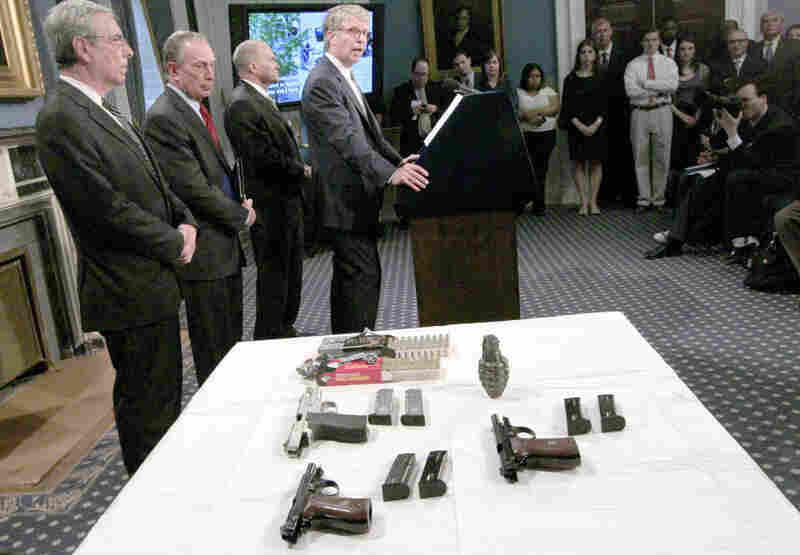 NYPD Deputy Commissioner for Intelligence David Cohen (far left) stands with other city officials to announce a foiled terrorist plot against a New York synagogue on May 12. Since the attacks of Sept. 11, 2001, the New York Police Department has become one of America's most aggressive gatherers of domestic intelligence. Its intelligence unit, directed by a retired CIA veteran, dispatches undercover officers to keep tabs on ethnic neighborhoods — sometimes in areas far outside their jurisdiction. The existence of the Intelligence Division & Counter-Terrorism Bureau has been public knowledge, but many of its operations were kept secret. An investigation by The Associated Press has uncovered new details about how the unit, led by Deputy Commissioner David Cohen, works. "The lesson of 9/11 to the NYPD was, 'We can't sit back and just let the federal government tell us how to keep us safe or what intelligence we need to know or who might be after us,'" AP reporter Matt Apuzzo tells Morning Edition guest host David Greene. "We have to take responsibility for this ourselves, and we're going to go to wherever we need to go to get this information." "What's new here is just how close a relationship the NYPD has with the Central Intelligence Agency. And how, because of that relationship, the NYPD has been allowed to expand its intelligence gathering in ways that go far beyond what any other police department in the country can do." "They have teams of undercover officers, they're known as rakers, who basically just troll ethnic neighborhoods. One officer described it as mapping the human terrain of New York. They also have informants known as mosque crawlers, who as the name indicates, just sort of hang out in mosques, being the eyes and ears of the police department inside the mosques." "If the FBI had an informant in a mosque, without information about a crime being committed, that would seem to violate the federal privacy act, which says the federal government can't collect or maintain information specifically related to First Amendment activities [without specific cause]." "The New York Police Department is our largest police department in the country. They get a lot of money from the federal government. There's not a lot of discussion about whether New Yorkers have given up any privacy or civil liberties in exchange for security. And because there's not a lot of oversight, I don't think New Yorkers actually know whether they've given up privacy and liberty in exchange for security." "Almost every person we interviewed said, 'Look, this is exactly what you need. This is what has to happen to keep New York safe. And if we don't do it, we're not doing our jobs.' And New Yorkers won't accept another attack. They will accept this, because it's what has to be done." "They're being creative in ways that come right up against the line of what the federal government or other police departments either can do, or feel comfortable doing." After September 11, the New York City Police Department decided it could no longer simply trust other agencies to prevent terrorism. Since then, the NYPD has gathered intelligence in ways that push the boundaries of the law. That's spelled out in an investigative report from the Associated Press this morning, revealing a police force unlike any other in the country. MATT APUZZO: The lesson of 9/11 to the NYPD was we can't sit back and just let the federal government tell us, you know, how to keep us safe or what intelligence we need to know or who might be after us. We have to take responsibility for this ourselves, and we're going to go to wherever we need to go to get this information. GREENE: Matt Apuzzo is an investigative reporter with the Associated Press here in Washington, D.C. and he joined us in our Washington studios. Matt, thank you for being here. APUZZO: Thanks a lot for having me. GREENE: So we knew that the New York City Police Department expanded its intelligence capability since 9/11, but you've really dug in deeper here. Tell us what's new. APUZZO: Well, what's new here is just how close a relationship the NYPD has with the Central Intelligence Agency, and how because of that relationship the NYPD has been allowed to expand its intelligence gathering in ways that go far beyond what any other police department in the country can do. They have teams of undercover officers - they're known as rakers - who basically just troll ethnic neighborhoods. One officer described it as mapping the human terrain of New York. They also have informants, known as mosque- crawlers, who, as the name indicates, they just sort of hang out in mosques, being the eyes and ears of the police department inside the mosque. GREENE: If the FBI carried out activities like that - clearly illegal, murky? Where would it fall? GREENE: Some sort of cause. APUZZO: Right, yeah. And the question is, at what standard? There was an informant for the NYPD who said he attended hundreds of mosque services and gathered information, even people who there was no indication of criminal activity. What's most fascinating about this story is the national discussion post-9/11 has been do you have to give up some degree of civil liberties and privacy in exchange for security. And the focus of that discussion for almost 10 years has been almost entirely on the FBI, the CIA. You know, the New York Police Department is our largest police department in the country. They get a lot of money from the federal government. There's not a lot of discussion about whether New Yorkers have given up any privacy or civil liberties in exchange for security. And because there's not a lot of oversight, I don't think New Yorkers actually know whether they've given up privacy and liberty in exchange for security. GREENE: You offer another example of the types of activities that the New York City Police Department's intelligence division is carrying out. They went and tried to dig into Pakistani cab drivers in New York to see who might be vulnerable, who might have illegal drivers licenses and see if they can use that to pressure these cab drivers to become informants. And you said another city, Boston, tried that very thing. APUZZO: And when Boston tried it, the Boston Police Department called neighboring Cambridge and said can we get a rundown of all your Somali cab drivers, and the police chief in Cambridge said absolutely not. You have to have some criminal indication here to do that; otherwise you're just trawling for information. You're just data mining. What the chief there said was you don't want to drive a wedge here between the police department and these communities. GREENE: And are there laws that would say that that's illegal, or is it more of, as the response from Cambridge was, that it's problematic because you don't want to drive a wedge between us and a part of the community? APUZZO: Exactly. And so they're being creative in ways that come right up against the line of what, you know, the federal government or other police departments either can do or feel comfortable doing. GREENE: You seem to suggest in your reporting that the people involved in this program would say, whatever questions there are, we are doing exactly what New Yorkers would want us to do. APUZZO: Absolutely. I think without question almost every person we interviewed said, look, this is exactly what you need. 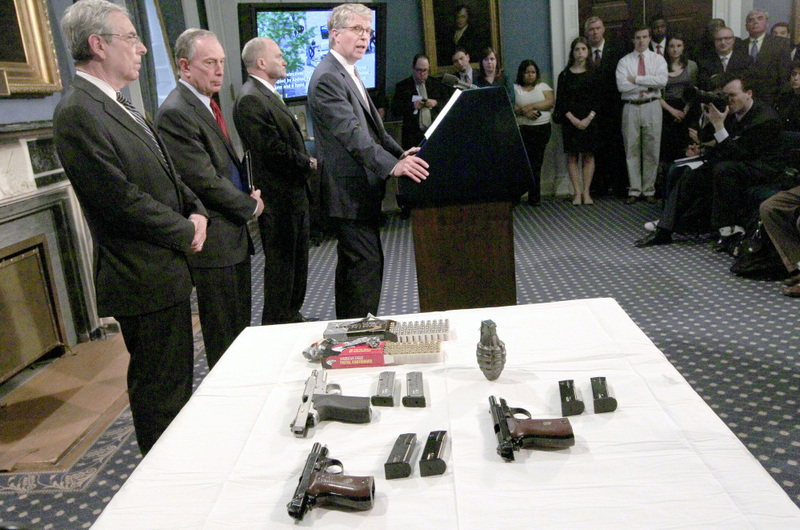 This is what has to happen to keep New York safe. And if we don't do it, we're not doing our jobs. And New Yorkers won't accept another attack. They will accept this because it's what has to be done. GREENE: Matt Apuzzo is an investigative reporter with the Associated Press based here in Washington. Matt, thanks for talking to us. APUZZO: Thank you very much.